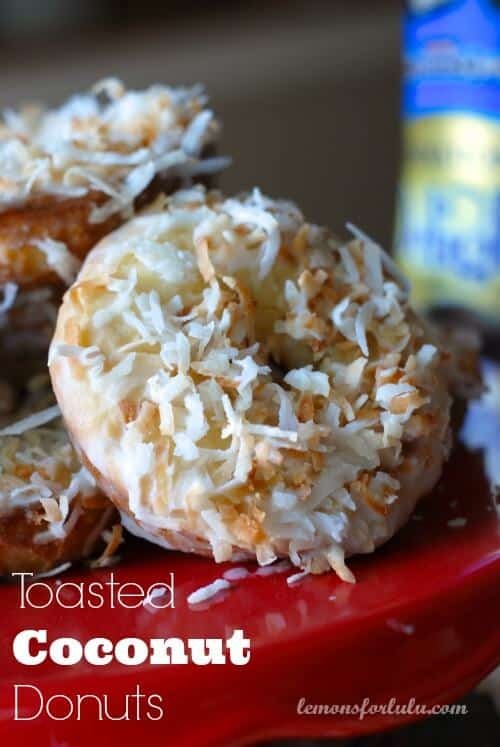 and topped with toasted coconut to make the moistest baked donuts ever! 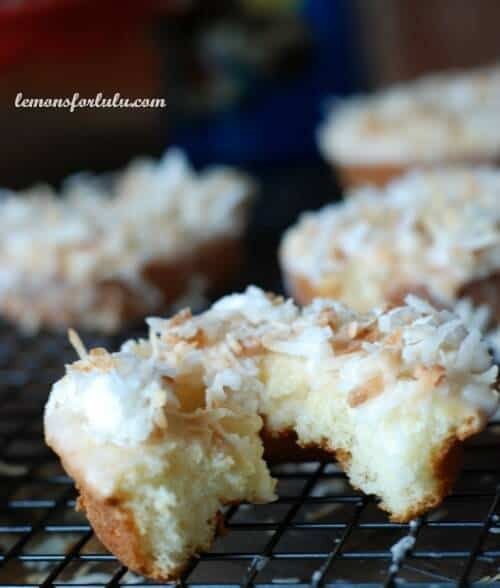 If you love coconut, these coconut donuts are for you! A perfectly sweet little cake for breakfast! S’more Chocolate Donuts and the Strawberry Donut Holes I make are pretty darn delicious! Another reason we don’t do this often is I’m too lazy to change out of my pj’s to drive the 15 minutes to the nearest donut shop! When I do pick up a dozen donuts, the box will look exactly like this: there will be 10 donuts with loads of sprinkles and then there will be two donuts with toasted coconut. Those precious two are for my husband and myself. And yes, I actually let my 3 kids eat the remaining 10 sugary and sprinkle-y donuts! As I said, we don’t do this very often! But I digress. Back to the coconut donuts. I fiercely love those coconut donuts! They are lightly sweetened but also a little nutty from the abundance of toasted coconut. I love them so much, that I’m usually tempted to buy an extra one for me to eat in the car. But then I think of my rear end, and thankfully that prevents me from buying more than necessary! I recently had a craving for those lovely coconut donuts. But as usual, I really didn’t feel like going to get them. Then the genius in me remembered I had International Delight Almond Joy Coffee Creamer in my fridge beckoning me to create my own perfect breakfast treats! To keep it simple, I used a boxed white cake mix, grabbed my donut pans and set out to recreate my favorite donut. You know what? These are even better than the donut shop variety! They were so moist and tender. To me, they were perfect little circular coconut cakes of heaven! I added creamer to both the cake mix AND to the glaze! 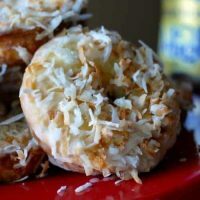 I topped each donut generously with toasted coconut for the ultimate coconut trifecta! They actually tasted better the next day (if you can save some until then). My son and I both ate two right away. Then I ate two more when the kids weren’t looking. Taste testing is a tough job… Now I can safely certify that these are truly the best donuts you will ever eat! My rear end be damned, I’m going to go eat two more! Preheat oven to 300. Arrange coconut on a baking sheet in a single layer. Toast in the oven for about 20-25 minutes, stirring every 5 minutes to prevent coconut from burning. Remove and let cool. To prepare donuts. Raise oven temperature to 350. In a bowl, combine eggs, melted butter and creamer. Stir in cake mix and whisk until there are no more lumps. Spray your donuts pan (s) with non stick spray. Fill cavities ¼ to ½ full. Bake for 13-15 minutes or until tops are just golden. Let donuts cool in pans for 5 minutes before removing to a cooling rack. To make glaze combine powdered sugar and creamer, stirring until smooth. Dip cooled donuts into glaze ( you may need more or less creamer depending on how thick you like your glaze). 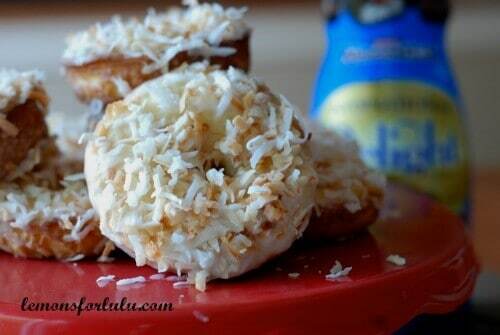 Dip tops of each donut into toasted coconut. Ok I can already taste these…they sound so amazing! And easy, too. My idea of perfection! Thank you Cathy! I think my kids thought they were perfect! Yes, Carrie, you NEED a donut pan! It will change your life. I’m not sure I could pass up sprinkles for coconut. I think I would need both. Donuts are such a treat!! Love that you used cake mix for this. I pinned all your donuts! I’m having a major morning sweet tooth. Both, I never thought of that! Yes, donuts ARE a huge treat and I never pass them up! What a great idea to use the coffee creamer and I LOVE toasted coconut, so I know I would love these! Toasted coconut is the best! Thanks Stephanie! It was a great addition Heather! I have not tried making my own doughnuts, but these look so good I just might! I love coconut, so these are right up my alley! I love coconut too and homemade is so much better! Tanya, these look so delicious!!!! I love coconut, too. 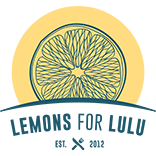 Thanks for sharing your recipe with us and pinning! Happy Sunday! These donuts look delicious Tanya! Thanks Trish, they were so good! I am on the hunt for a good donut for this weekend.. Found them. Haha, yes I need someone to confirm how good they taste! Oh coconutty goodness, how I could eat you all up right now!!! Um, yeah, I did eat them all up! I love coconut.. more than just about any other flavor out there. Topped on donuts, and I am SOLD! Toasted coconut is the best! Thanks Holly! I know what you mean about donuts. Once I start eating them, I can’t stop. I am o glad you used the Almond Joy creamer, I love that stuff! Going to have to make these soon. I love that creamer too. I could probably just skip the coffee! I don’t have a doughnut pan. Wondering if the mini bundt pans would work adjusting the time a tad???? I think it could work, I would just watch them in the oven carefully. 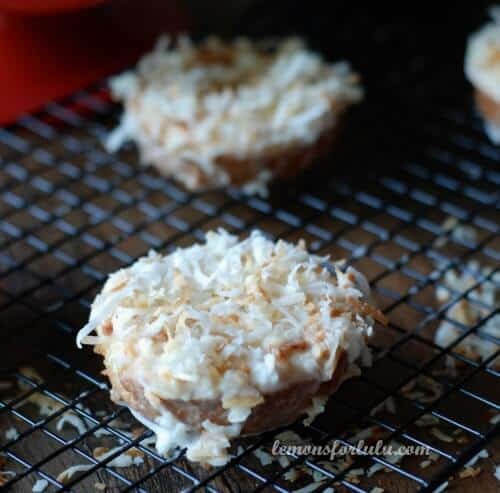 Funny…as much as I didn’t like coconut as a kid, I always LOVED toasted coconut donuts! Great recipe, Tanya!